[Hong Kong] Jason Chiu, CEO of Cherrypicks, invited to share his entrepreneurial knowledge on the panel discussion at University of Waterloo’s Velocity Investor Demo Day (Hong Kong) on 23 Nov. The panel, moderated by Michael Kerr, VP Business Development of Cherrypicks, included Neil Want, CIO of AMTD Strategic Capital, Roland Yau, Managing Partner in CoCoon Ignite Ventures, and Adrien Cote, Science Lead and Business Advisor of UWaterloo Velocity. 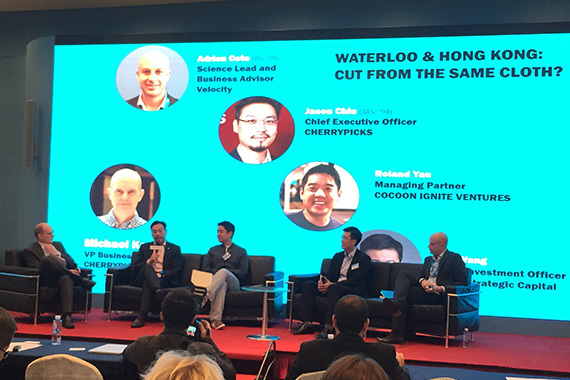 Themed “Waterloo and Hong Kong: cut from the same cloth (entrepreneur mindset)?”, the panel compared the differences and similarities of the startup culture between Hong Kong and the University of Waterloo. The panel also drew from their entrepreneurial experiences to offer insight on improving the supportive environment for startups in Hong Kong, to better meet the needs of the local entrepreneurial community.